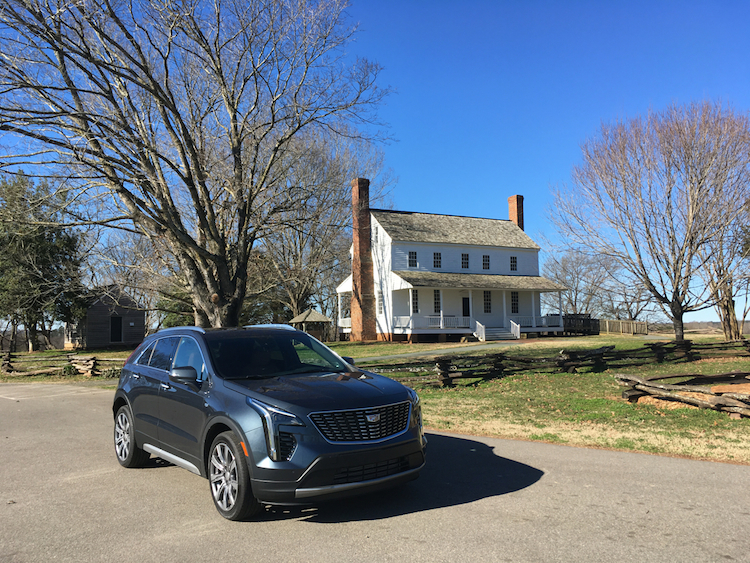 Strike a pose: The 2019 Cadillac XT4 in front of the 1772 Alston House. Late to the SUV game, Cadillac has been playing catch up since. Sure, its flagship Escalade was one of the first luxury utility vehicles of its kind and the SRX (now XT5) followed five years later in 2004. But it has taken until 2019 for a third utility vehicle, the compact XT4, to roll out. It will soon be joined by a fourth model, the XT6, this spring. Arriving late has cost GM’s premier brand some sales, but its product portfolio will soon reflect the kinds of vehicles customers want. 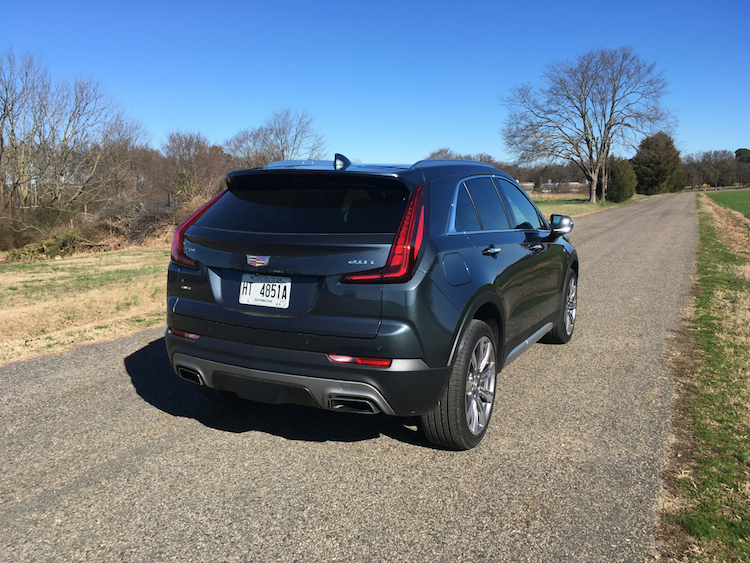 In the XT4, Cadillac delivers a small crossover with room for five. It targets one of the fastest growing segments, taking on the likes of the Lexus NX, BMW X3, Acura RDX, Volvo XC60, Mercedes-Benz GLA-Class, Lincoln MKC, and the Audi Q3. Cadillac offers the 2019 XT4 in Luxury ($35,790), Premium Luxury ($40,290), and Sport ($40,290) trims. Prices include a $995 destination charge. All models come with a turbocharged four-cylinder engine and an automatic transmission. Front-wheel drive comes standard; add $2,500 for all-wheel drive. The two top trims are priced the same as they take different approaches to the market, based on luxury and sporty attributes, mostly. The available packages allow for much customization, although prices can rise quickly. For instance, the base model offers three packages. A Cold Weather Package ($850, with automatic heated steering wheel, heated front seats and heated rear outboard seats), Trailer Package ($300, with a trailer hitch receiver, heavy-duty cooling system, and a wiring harness), and a Battery Protection Package ($130, with a battery tender, plug-in cord, carrying case) are the choices here. You’ll find five additional packages available with the Premium Luxury (PL) and Sport (S) trims, with some price and content differences between the two. These include Comfort and Convenience Package ($1,050 PL, $2,450 S); Enhanced Visibility Package ($1,500); Technology Package ($1,650 PL, $1,400 S); Driver Assist Package ($1,100); and a Driver Awareness Package ($770). 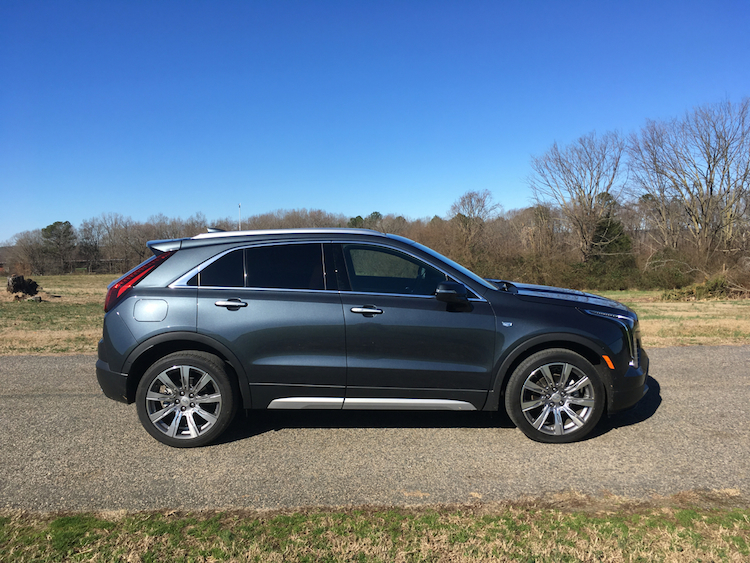 We’ll mention what these packages bring in throughout our review, typically as part of the available features for the 2019 XT4. An eye-catching design is a Cadillac forte, especially with its utility vehicles. Credit the Escalade for creating the environment for delivering a look that is at once powerful as it is elegant. Somehow, Cadillac managed to apply that design theme to its crossovers, beginning with the XT5, followed by the XT4. Doubtlessly, the upcoming XT6 will share those attributes. The current Cadillac look traces back two decades to the brand’s “art and science” design scheme, which has evolved noticeably since. The XT4 is marked by creased metal, sharp lines, strong shoulders, and a wide grille. The front lights offer a dramatic touch as they begin about halfway up the front end and split off in the middle with one part pushing towards the grille and another easing down to the side pockets. Together, it has an anvil-like look, blending gracefulness and vigor. Standard features include automatic LED headlamps, power adjustable and heated side mirrors, and 18-inch alloy wheels. Upgrades include LED cornering lamps, automatic wipers, illuminating door handles, roof rails, and a power liftgate. A power slide and tilt sunroof are also available. Inside, the cabin is warm and bright. The sculpted dashboard slides down to the right, with layers, soft textures and twin stitching evident. The big surprise is the center stack, which is simple and uncluttered. Cadillac arranges all controls horizontally below the screen in piano-like fashion. Firm, yet comfortable seats are in the first row. 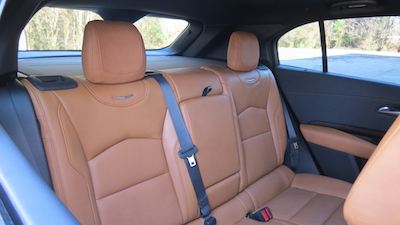 The second row has the requisite split-bench seat. 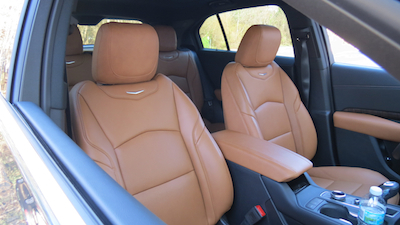 Notably, the exterior is roomier than you might expect, with ample legroom at the ready. Cadillac supplies the XT4 with keyless entry and push-button start, full power accessories, a tilt-and-telescopic steering column, power front seats, imitation leather-trimmed seats, and dual-zone climate control. 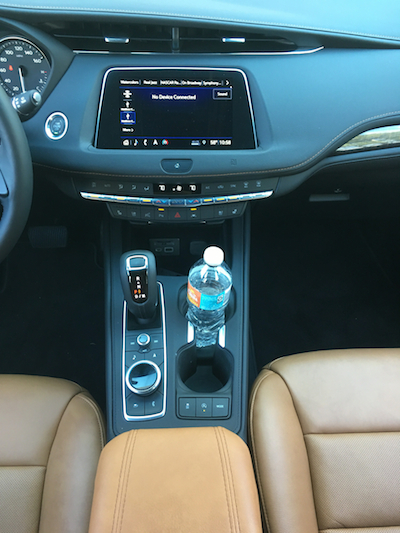 Available features include leather-trimmed seats, aluminum and wood trim, a heated steering wheel, heated and ventilated seats, a sport steering wheel, sport pedals, and ambient lighting. Technology and Cadillac go hand in hand. That’s something we have seen for years, although some of its tech features needed improvement. 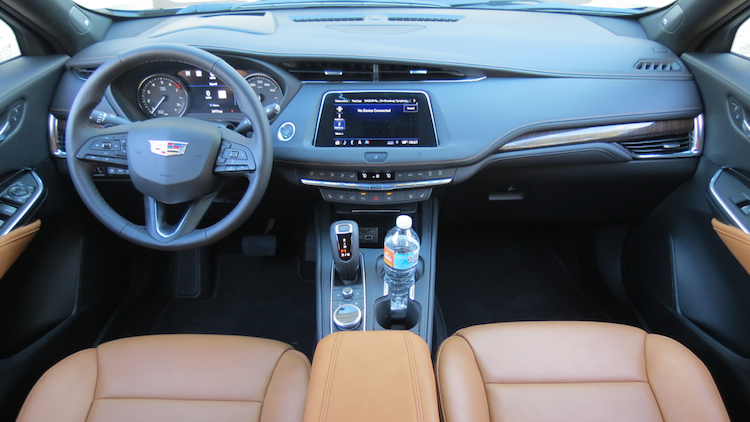 Fortunately, the Cadillac User Experience (CUE) interface has improved in time for the XT4’s release, delivering an 8-inch screen, Apple CarPlay and Google Android Auto smartphone compatibility, and Bluetooth connectivity for up to 10 devices. The XT4’s important controls are lined piano-key-like under the center display. The XT4 also has four USB ports, and comes with a seven-speaker audio system with HD Radio and satellite radio. The list of options includes a 13-speaker Bose audio system, navigation, wireless charging, and a rear camera mirror that supplies a wider view of what’s behind you. A head-up display is also available. On the safety front, the XT4 comes with rear park assist and Teen Driver, the latter serving as a system that helps parents teach their children safe driving habits. Lane change alert with side blind zone alert, rear cross traffic alert, and a safety alert seat are standard with the Premium Luxury and Sport trims. For more advanced driver-assist features, you’ll have to opt for either a Driver Assist Package (adaptive cruise control, forward and reverse automatic braking) and a Driver Awareness Package (forward collision alert, lane keep assist with lane departure warning, front pedestrian braking, low-speed automatic braking and automatic high beams). We’re seeing these kinds of features standard on more models, but they’re still extra with Cadillac. 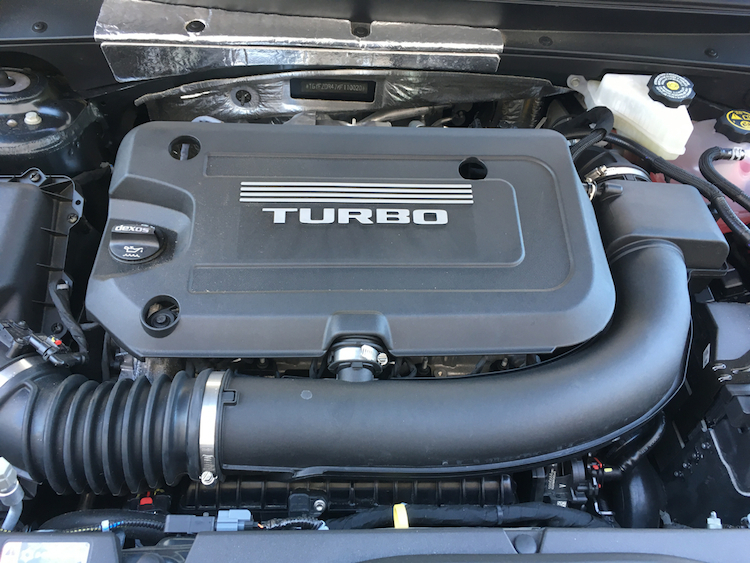 Powering every 2019 XT4 is a turbocharged 2.0-liter four-cylinder engine. This one makes 237 horsepower and 258 pound-feet of torque. It works with a 9-speed automatic transmission. The powertrain combination is a good one for the XT4, supplying ample step-off power and generous passing performance. The transmission shifts quickly, moving through each gear methodically under steady acceleration. The XT4’s turbo spools up quickly and syncs well with a willing 9-speed automatic transmission. The XT4 benefits from a comfortable ride, crisp steering, and decent handling. Choose the Sport version and you can opt for the active sport suspension system, which supplies improved handling. Oddly, the available all-wheel-drive system (as found in our test vehicle) is part-time. It must be activated to engage it, which is done through the drive mode system. We’re not sure why Cadillac went with this arrangement, but it is possible that it supplies this crossover with a slight boost in fuel economy. Regardless, you’ll need to remind yourself to activate the system as conditions warrant. The XT4 brings an affordable crossover option to the Cadillac line. But prices can quickly rise as you choose your options. Go with all-wheel drive and your base cost is $2,500 higher. We recommend starting your build with either the Premium Luxury or Sport trims. Our test Premium Luxury model came with all-wheel drive and added a power liftgate, leather-trimmed seats, ambient lighting, lane change alert with side blind zone alert, rear cross traffic alert, and front and rear park assist. Add in one or two of your favorite packages and your final cost will push past $45,000. That’s still about $10,000 less than our preview test model, which also came in Shadow Metallic paint, a $625 upgrade. Cadillac XT4 photos copyright Auto Trends Magazine. All rights reserved.